Create your own personal ComfortZone at the wash basin – with mixers from hansgrohe's Metris range. 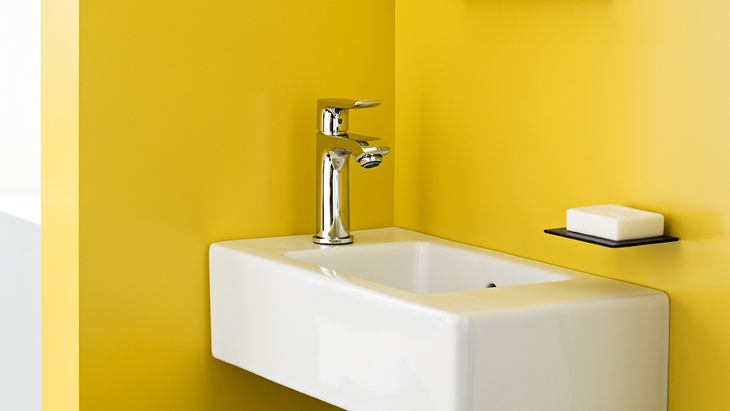 Choose single lever basin mixers in various heights or mixers for wall mounting. You can also furnish your bidet with Metris mixers. The Metris mixer range includes various mixers for your bath tub. Depending on the installation scenario, you can choose single lever mixers for wall mounting (exposed or concealed installation) or mixers for the bath tub rim. Regulate your shower water in contemporary style: using either Metris single lever shower mixers or stylish shower thermostats. This hansgrohe mixer range adds timeless clarity to the bathroom, transforming it into an elegant haven of relaxation. With its geometric design concept, it focuses on the basics. Metris S mixers look impressive on wash basins, bath tubs, showers and bidets. And thanks to EcoSmart technology, they are economical to use.